The UMF Medical Power Podiatry Chair is a fully featured, ADA compliant Power Chair with the highest quality and design standards. Supporting a patient capacity of up to 650 lbs and a lower patient access height of 18.5” ( ±0.5”), the Power series Podiatry Chair is an excellent choice for your healthcare facility and treatment room. The Power Chair design is well thought through in every single detail that greatly enhances both patient comfort and practitioner’s experience. The Chair is assembled with four power functions: Hi-Lo, Back, Tilt, Leg Lift & Extension. The OneTouch Patient Positioning® Programmable Hand Control is a very versatile tool allowing easy Chair manipulations with no extra effort on the practitioner’s side. 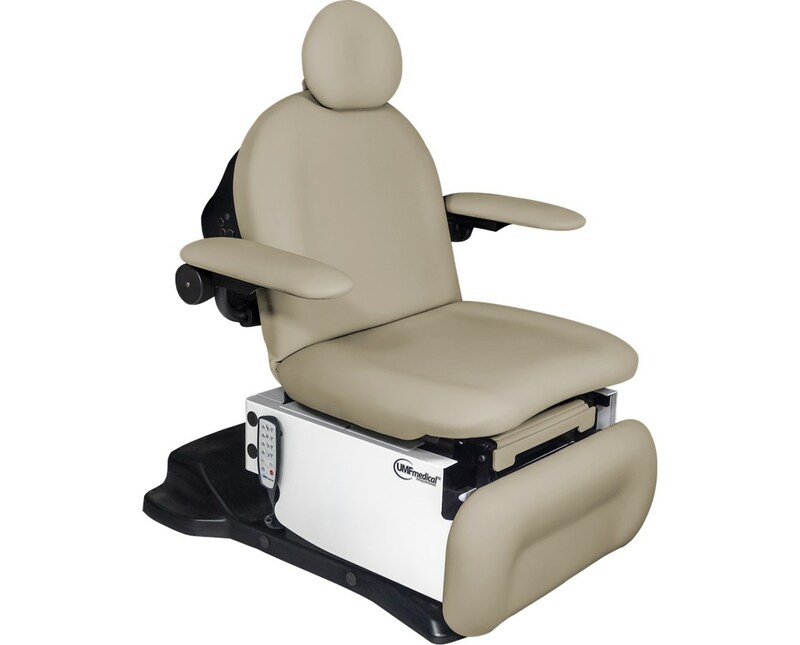 Power Leg Lift combined with Adjustable Articulating head rest are excellent features that make it easier for patients and staff to manipulate the chair accordingly without sacrificing comfort. 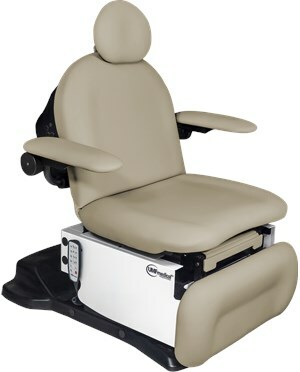 Ultra-Comfort Seat and Back Cushion provide the ideal seating environment for patients, to ensure that they are comfortable even if they sit for longer hours. Its Dual Electro-Mechanical Actuator System allows for efficient speed. It has an upgraded, 650-lb capacity and low access ADA Height of 18.5", that provide the ultimate versatility and durability. Interchangeable headrest options allow for easier customization. Other great features include a hospital-grade receptacle of 110v with Child Safety Cover and a concealed Paper Roll Holder for added convenience. These features facilitate easy accessibility for patients with limited mobility, which is convenient for both the healthcare provider as well as the patient. In addition, UMF Medical presents the Ultra Comfort Seamless Top. It is a vacuum formed top that is excellent in usage and very easy to clean helping to avoid any risks of patient cross contamination. Please select from the drop down menu above and click "add to cart"
NOTE: This is an updated model. The previous model has been enhanced and upgraded with more advanced features, including a more modern design. 650 pound (272.2kg) weight capacity. 18.5" (48.3 cm) low access seat height. Three function memory position foot control. Adjustable, sliding, removable stainless steel debris tray (5.6 Qt. / 5.3 L).